Given a choice, most people wouldn’t spend any length of time in a hospital. But it’s become the norm for one patient suffering from Crohn’s disease. The patient – who didn’t wish to share her name – has spent nearly 100 days at Methodist Hospital in less than three years. 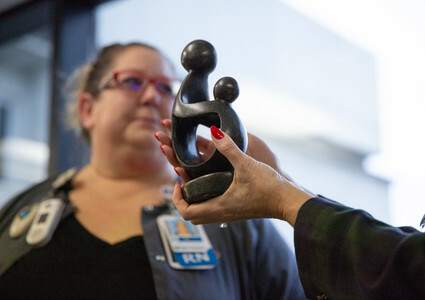 The patient described one of her most recent stays as “life-changing,” and it’s all thanks to Kim Pojar, BSN, RN, from the Methodist Hospital General Surgery/Medical Unit on 8 South. Kim didn’t need a name to know which patient wrote the letter. She knew as soon as she read it. “She was someone I connected with right away,” Kim said. In one part of the letter, the patient described Kim transforming into a literal cheerleader to help raise her low blood pressure. “We did!” Kim exclaimed. “I’d say, ‘Oh, your blood pressure is getting kind of low, should we do it? Should we get up?’ So, yeah, it was fun – kind of an inside joke." Kim went above and beyond again when it came time for the patient to be discharged. It was a Sunday evening, and it was getting dark, the patient wrote. The person she had arranged to pick her up from the hospital cannot see at night. She reported feeling exhausted and worried about getting home. That’s when Kim called a cab driver, who got the patient home and unloaded all her belongings. “She had me out of the hospital in five minutes,” the patient added. Kim was honored as December’s DAISY Award winner for Methodist Hospital and Methodist Women’s Hospital.